Coro do Teatro Nacional de São Carlos, Orquestra Sinfónica Portuguesa / Graeme Jenkins. Stage director – Graham Vick. Teatro Nacional de São Carlos, Lisbon, Portugal. Saturday, January 19th, 2019. 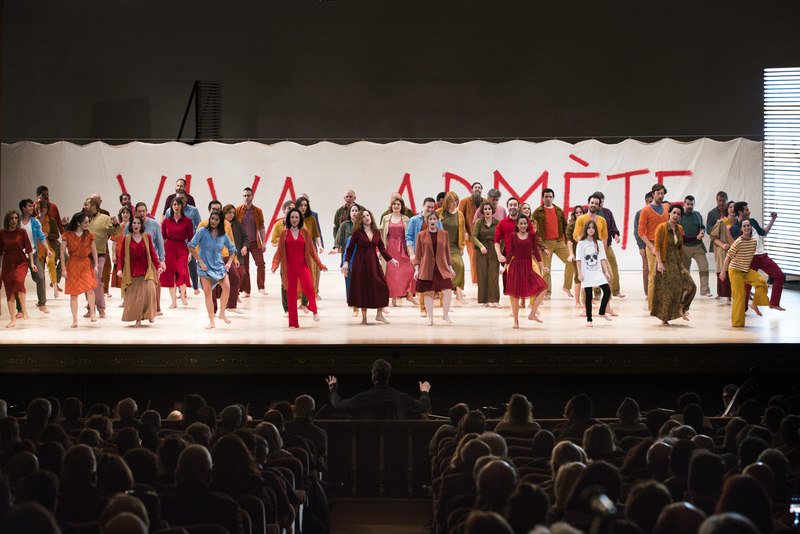 What is an opera performance if nothing other than an act of recreation? Indeed, no two live performances can ever be the same. Even two performances in the same run with the same cast, can differ from one evening to the next. Every staging, every evening, involves a process of creating a work anew, from scratch. Graham Vick’s new production of Alceste for the Teatro Nacional de São Carlos takes this idea as a starting point, quite literally, as the audience is confronted on entering the auditorium by what appears to be a rehearsal room, complete with empty coffee cups on a table with a few chairs. The chorus members (as much of a protagonist in this work as the principals), enter by carrying in their own chairs. The cast very much engage in precisely that act of recreation right in front of us, transforming this blank canvas into a living piece of theatre. The costumes (Conor Murphy) seem to reflect that rehearsal setting, all pastels with a relaxed, casual look. Where Vick’s staging succeeds is in its precisely intricate personenregie, creating clearly identifiable flesh and blood characters. The chorus was composed of clearly recognizable individuals, whether as a mass acting together, or attending what appeared to be group therapy sessions. In Act 2, they busted some fierce moves, bringing out the celebration of Admète’s recovery. This was very much a performance that lived through the text. Diction was absolutely clear throughout the entire cast, with the result that this was an evening that lived both in what we saw, through the physical manifestation of the characters, and in what we heard. The cast had obviously been directed with great care and they threw themselves (often quite literally) into everything asked of them. 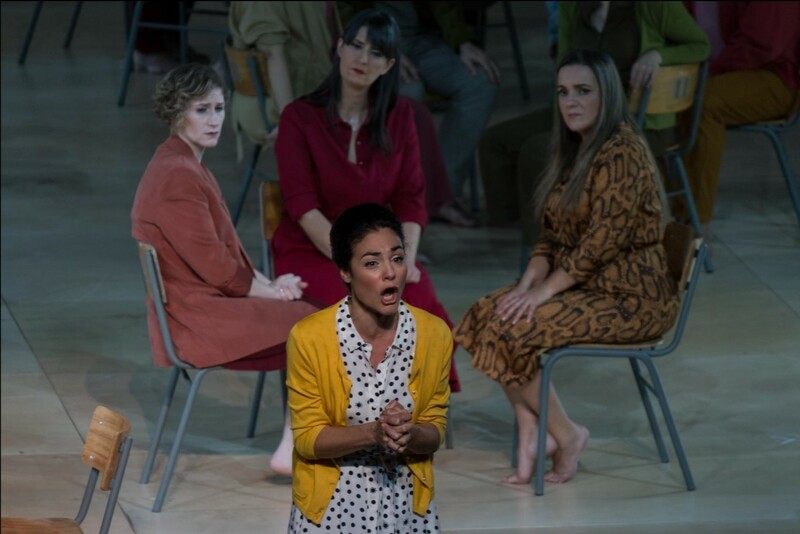 And yet, despite the undoubted clarity of the direction, there were moments where Vick’s staging felt clichéd and worked against the music and the text. For instance, the chorus and ballet having what appeared to be epileptic fits during a religious ceremony led by the Grand Prêtre d’Apollon. Or the body popping ballet in Act 2, which felt random and unconnected to the rest. The ballet dancer who gave birth to a red dress, which was then worn by the Oracle, and Hercule’s appearance in Act 3 in a Superman-inspired costume both felt rather facetious, as if unwilling to take the work seriously. I’m still wondering why Apollon showed up as Christ-like figure, complete with a crown of thorns and stigmata. 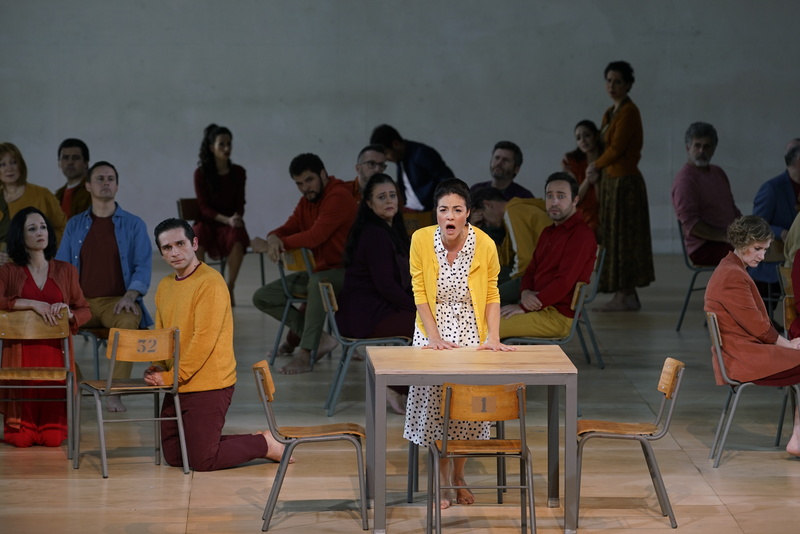 The result was that it diminished the palpable tenderness and passion in the relationship between Ana Quintans’ Alceste and Leonardo Cortellazzi’s Admète. Both were extremely game in how they danced the closing ballet, and the effect was most moving, both of them finding comfort in reconciliation. There are evenings when one feels lucky to witness a star-is-born moment. Tonight, Quintans most definitely gave us one of those. Her Alceste was a statement of intent, commanding the stage, right from her initial entrance walking down the central aisle of the auditorium. Sung off the text, in impeccable French, hers was a living, breathing incarnation of this great role. Quintans’ is a brighter voice than one often hears in the role – a crystalline sound with a delightful hint of a natural vibrato. Her Alceste was deeply impassioned, a great tragédienne, unafraid to wear her heart on her sleeve. The voice had enough metal in the middle to carry in this intimate house, with its grateful acoustic, while the top opened up gloriously. The classical beauty of her singing amplified the beauty of the music, nowhere more so that in a devastating ‘Ah, Divinités implacables’, Quintans pouring out streams of emotion with her elegant legato enhanced by judicious embellishments to the line. 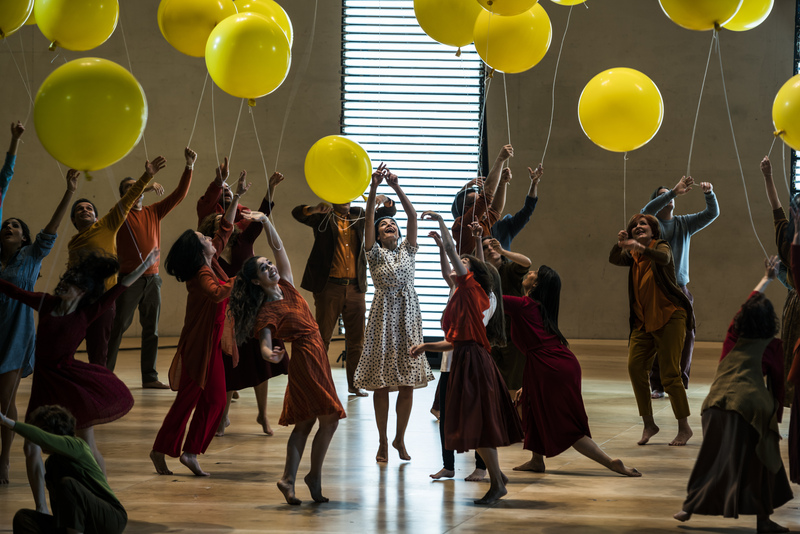 It sounds that Quintans is still learning to pace herself in the role – the end of Act 2 saw her needing to sacrifice beauty of tone and lacked resonance. That said, this was very much a commanding and complete performance from a notable artist. Cortellazzi’s Admète was sung with lyrical and liquid tone. He brought out a palpable, emotionally potent sense of betrayal with good use of the text. The role sits very well for his well-placed, nicely forward tenor. It’s an attractive, handsome sound, easily produced. Alexandre Duhamel was imposing in his roles. His vocalism was most extravert but it sounds to me that the voice has a tendency to dryness when singing full out. When he pulls back, there’s a pleasing velvety warmth to the sound. He camped it up most entertainingly as Hercule, he has stage presence to spare, and his native diction was always nicely clear. Certainly a singer I’d like to hear again. The remaining roles were a credit to the house and admirably taken. The firm baritone of João Fernandes was most notable, and we had a mellifluous quartet of Coryphées with some lovely, lyrical singing from Raquel Alão. There was an honesty and immediacy to the communication of the house chorus. They blasted out at the start with full-throated fervour, singing with confidence and strength. The sound was bold and vibrant but without that war of vibratos often heard elsewhere. Their dedication to everything asked of them was most impressive, combined with enough energy to power the entire city. Graeme Jenkins led a swift and exciting reading, the orchestra digging deep with bold and extrovert playing, happily far from the passive stateliness often imposed on this music. His tempi were always alive and vital, propelling the action forward. The Orquestra Sinfónica Portuguesa played extremely well for him. There was some passing scrappiness in the strings, not unknown on a first night, and the brass was deliciously raspy and full of personality. Of course, I would have preferred to have had the strings play without vibrato – the full vibrations felt somewhat out of place with Jenkins’ surging dramatism – but this is of course personal taste. Both the orchestra and the chorus reflected most positively the qualities of this estimable house. This was ultimately a very satisfying evening. It was well played and sung in a production that had so many positive attributes. It had clearly been intensively rehearsed and marked the work of an incisive theatrical mind, even if some aspects felt unconvincing and gratuitous. That said, it was very much a performance that lived through the text, rendering the Portuguese surtitles superfluous. Above all, to cap the excellence of the whole tonight, we witnessed an outstanding, career-defining performance from Quintans. 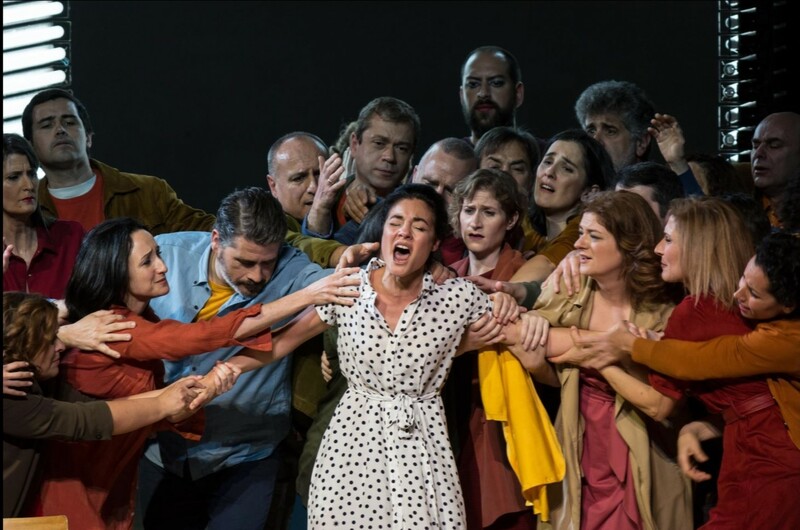 Her Alceste was defiant, tender, passionate, and held the stage. A most remarkable assumption. Agree with almost all of this: a great evening in the theatre with one or two annoyances but nothing to detract from the overall clarity of the storytelling and the beauty of the music and singing.